Improve sidewalk spaces, entranceways and outdoor patios by reducing cigarette debris with Slim Post Snuffer Smoking Receptacles. 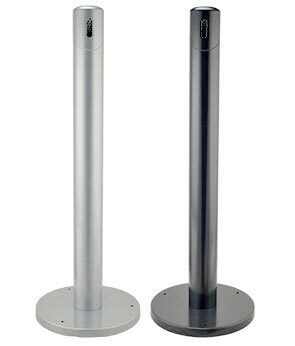 The 4" diameter fire-safe steel post is stabilized by the weighted steel base and features a user-friendly disposal opening with snuffer plate for confident extinguishing of disregarded smoking materials. The key-locking lift off top helps conceal and contain the used cigarette butts and makes for quick routine maintenance of the inner steel tray. Built to withstand the rigors of outdoor duty, the safe steel Slim Post Snuffers are finished with an ultra-resistant powder-coating and come standard with drop in anchor bolts to accommodate surface mount installations. ►Need a Smoking Receptacle Fast?